That’s all folks - the summer is over. No, don’t be sad! Think about all the good stuff the autumn brings - beautiful trees covered in gold and ruby, mushrooms popping here and there, seasonal affective disorder… Rains, muddy puddles, winds, nights starting at 6 p.m., what else we forgot? Well, we guess this is a bit depressing. Nevertheless, we have a whole lot of good things expect to happen - the release of Magento 2, for example, or Christmas in about 4 months. 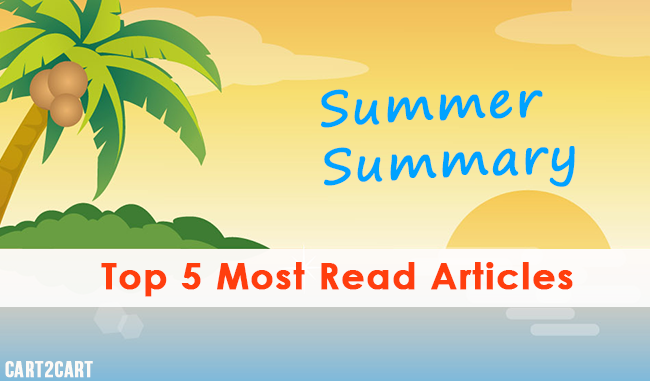 Or reading “Top 5 Most Read Summer Articles” on Cart2Cart blog. Already excited about the last one? 1. What can be better than watching a play of two elite hockey / football / soccer teams? For us, and a thousand of our readers, it’s a fierce competition between WooCommerce and Magento. An article “WooCommerce vs. Magento: Rivalry is Heating Up” caused a real stir and gave birth to serious, sometimes brutal discussions in comment sections. And what do you think - who’ll take the yellow jersey of the leader? 2. If there’s something people are waiting more than for the Apocalypse (sic! ), it’s the release of Magento 2. The interest for this strongly desired platform is so high, people eagerly devour every new bit of related information they can get. Probably, that’s the reason for such a great popularity of “What Experts Think of Magento 2 [Infographic]” - an infographic comprising 6 most valuable expressions on Magento 2 from e-Commerce experts. 3. Talking about authoritative people in e-Commerce field, the 3rd most popular Summer blog post on Cart2Cart is an interview with Ryan Street, a renowned Magento trainer. Being a fascinating storyteller, Ryan takes a look into the past of his career path, gives practical recommendations for users topical nowadays, and makes predictions about the future of Magento 2. So, what does Ryan Street have to say? Read “Effects of Magento 2 Will Be Like an Atomic Bomb - Interview with Ryan Street” for amazing discoveries. 4. One of the biggest / most disappointing e-Commerce news lately was the announcement of Amazon Webstore shutdown. The shopping cart intended to conquer the market of hosted solutions is planning to cease its functioning on the 1st of July, 2016. What’s the conclusion? On this occasion, we’ve prepared an analytical article “Amazon Webstore Closing - How and Why Did It Happen?” trying to dig a little deeper into the history and reasons for its decay. “What to do next?” is not a question anymore. Check it out. 5. The 5th article in our list is more or less alike the 1st one, but deals with a detailed comparison of Magento vs OpenCart instead. Both popular, free, open source and functionally rich, how can you make a proper distinguishment between them? Apparently, you can - just as we did in “Magento vs OpenCart - What’s Best for Your Business?“. Read the article and oppose or support the community opinion by giving a vote for your favorite solution! Well, it seems that not the Summer only, but our digest has ended too. Want some more? Check out our freshly published white paper “What Builds a Perfect Shopping Cart in 2015: 69 Stats to Know“ for a load of useful insight information. Good luck, and keep your feet warm! It’s Autumn after all.